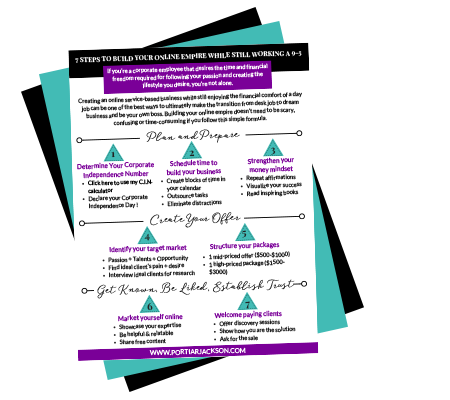 Sign up and receive the 67 Business Ideas You Can Start Today While Still Working in Your Corporate Job! BE YOUR OWN BOSS + CREATE UNLIMITED INCOME + COMPLETE SCHEDULE FLEXIBILITY WHILE HELPING OTHERS AND MAKING A POWERFUL IMPACT IN THE WORLD? Say hello to more clients with less effort. Say hello to increasing your income on your own terms. Say hello to running your dream business with ease. I’ve stood in your shoes and know how you feel. You want to help people, do what you love, and earn more than enough money to support your lifestyle. That’s why you’re bootstrapping your online business while still working your full-time job. Problem is, your time is limited and so are your profits. Ready to increase your profits and transform your business into a consistent revenue generating machine? I’m Portia and I help entrepreneurial women hiding out in corporate jobs take their online service-based business from start-up to streamlined. Watching smart, educated women treat their businesses like a hobby makes me cringe more than watching the first round of singers on American Idol. You know your business should be taking off but you don’t know what to do next. I can help you with that! DITCH THE OVERWHELM. GET FOCUSED SO YOU CAN GET YOUR BUSINESS PROFITABLE ! 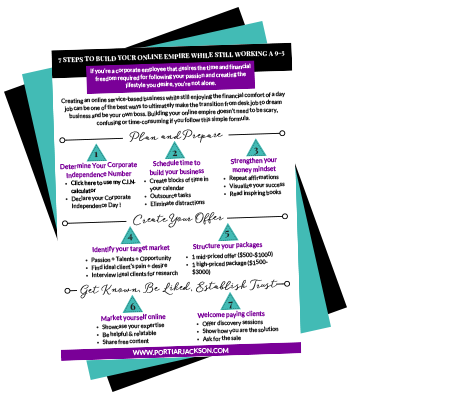 I create strategies and step-by-step implementation plans so you can make the most of those 10-15 hours you can dedicate to your business every week. As a former rocket scientist (yes, really I have a PhD and everything), I love bullet points and lists like a fat (or skinny) kid loves cake. Let me help you strategize, systemize, and start earning the money you deserve. Ready to start your online business rather than just dreaming about it? Sign up for my free training and workbook that will guide you step-by-step in creating your online business plan. It’s time to take action, get this free training today. I’M READY TO START MY BUSINESS! “I was able to quit my 9-5 halfway through her program…”After working with Portia I am more confident in myself and my abilities. I am not afraid of selling myself and putting myself out there AND I was able to quit my 9-5 job half way through her program. I recommend working with Portia to anyone who is thinking of starting an online business and has ideas, but doesn’t have the know how on how to actually execute. Portia not only helps you find your strengths, but she teaches you how to implement proven strategies. Working with Portia has changed my life. Craft a business strategy to help you identify and locate your ideal clients, craft a package and price point that appeals to them, and create a marketing strategy that magnetically attracts your clients so you can make more money. My free online community for corporate woman looking to start, grow and make money in their service-based online business. Free trainings, accountability, and support plus much, much more. GETTING EXCITED? READY TO GET STARTED?